It’s only nine days away until our Colour Explosion Fun Run event on Friday 26thOctober! What time will the run take place and how long will it take? Each age group will run for approximately 20 minutes. There will photo opportunities at the end of their run before the classes head back to their classrooms. The afternoon will be run by our Parent and Community Group, student leaders and teachers. A white T shirt is best for a colour run. Old shorts, socks, and shoes are also a good idea as they may get colour powder on them as well. Bathers or other tops can be worn under the white T shirt if preferred. Students can come to school dressed in their running gear, ready to go. An old towel and change of clothes may also be worth bringing on the day. The Coromandel Valley CFS volunteers will also be attending with one of their trucks in one area of the run so students may choose (they can dodge this section) to get wet as they run the course. Students are not expected to have their school hat on during the run however, students can wear a hat if they choose. To preserve the colour on your COLOUR RUN T shirt after the event, try soaking it in a mixture of water, salt, and vinegar. This helps the colour lock into the cotton and prevents the colour running. What if we don’t want to register online to fundraise? 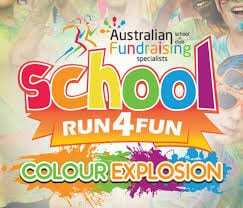 It is very easy to register your children to fundraise online at schoolfundraising.com.au – this will allow them to easily share a link with friends and families to donate, as well as very easily choose their prizes after the COLOUR RUN. However, if you prefer, you can simply collect cash and drop it off at the front office and your child can choose their prizes in the prize pamphlet and return it to the front office. This event is the major fundraiser for our school so we are asking all children to participate in fundraising. However, even if children are unable to raise funds for the event they are still welcome to participate. If children wish to not be squirted with colour, due to concerns of asthma or allergies or any other reason, they can bypass the colour stations and will not be squirted. Children who do not wish to be squirted may also choose to wear a bright coloured T shirt (instead of a white one) as a way to still be colourful on the day and to signal that they do not wish to be in contact with the powder. How far do children have to run? The run will lap around the school oval including a series of obstacles which may include: climbing, crawling, jumping, sliding, balancing, dodging, and more! The colour stations will be spread throughout the course so that children get multiple squirts of colour. Students can complete as many laps as they choose within the set time. Can family come to watch the event? Yes, we would love to have parents and family come out to watch the event! We will ask that parents watch from the designated viewing area which will be set up in the middle of the oval, with the obstacles placed around the outside of the oval, to offer a view of the entire course. If there is bad weather on the day of the event, the Run4Fun Colour Explosion will be postponed to another suitable date in term 4. Based on the weather forecast, a decision will be made by 1pm on the day before the event and communicated to families. We are all looking forward to this fun event as a great way to celebrate the end of our Sports Expo week.